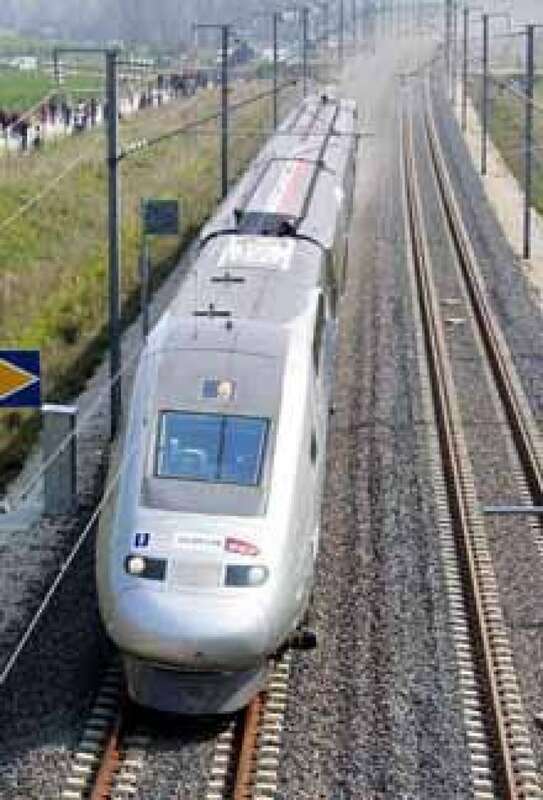 A French high-speed train broke the world record for conventional trains on Tuesday, reaching speeds of up to 574 km/h. A French high-speed train broke the world record for conventional trains on Tuesday, reaching speedsup to 574 km/h. At that speed, people watching by the side of the tracks barely saw the train go by, said CBCjournalist David Common, reporting from the Champagne-Ardennes train station near Reims. The black-and-chrome train with three double-decker cars, named the V150, bettered the previous record of 515.3 km/h. That record, set in 1990, is also held by a French train. Still, the new speed falls short of the ultimate record set by Japan's magnetically levitated train, which reached 581 km/h in 2003. On Tuesday, the French train hurtled down a stretch of a new line linking Paris to eastern France at about the speed of a short-distance freight propeller plane. The train used in Tuesday's experiment— a TGV, short for train à grande vitesse, as France's bullet trains are called— has larger wheels than the usual TGV to cover more ground with each rotation. It also has a stronger, 25,000-horsepower engine. The double-decker cars were transformed into a laboratory for the event so that technicians from the state-run rail company SNCF and Alstom, which makes the fast trains, could gather data during the run, according to the Associated Press. Test data should help improve the security and comfort of passengers in the future.